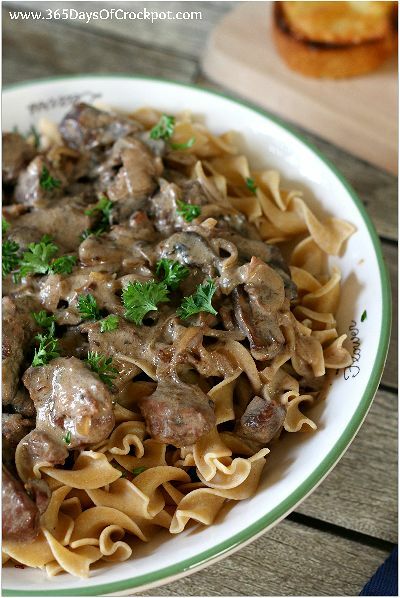 Slow Cooker French Onion Beef and Mushroom Stroganoff–a delicious mash-up of two of your favorite dishes, French onion soup and beef stroganoff. 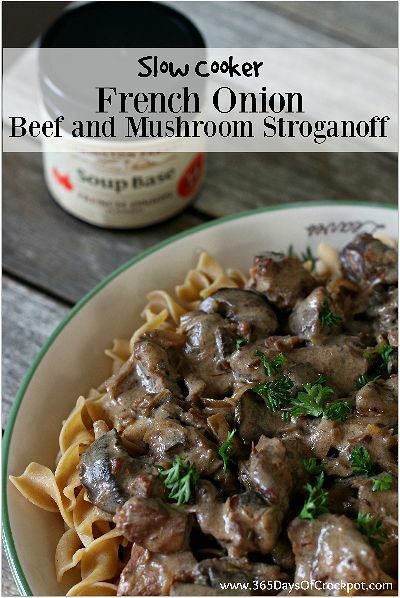 If you love a good bowl of French onion soup and a creamy and beefy stroganoff, you’ll love this recipe! This recipe is sponsored by Orrington Farms. Thank you for supporting this blog and its sponsors! Recently, I was introduced to a brand called Orrington Farms. They sell lots of products specifically for the slow cooker and also soup bases. Some of their products that I’m very excited to try are the slow cooker seasoning mix for chicken noodle soup and their ham broth base. For this recipe I used their French onion soup base. I don’t know about you but I really love French onion soup but I don’t eat it very often. It just seems too fussy to make at home and so I really only order it at restaurants. I love the caramelized onions and the beefy broth. 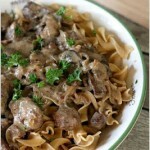 I also really love beef stroganoff with it’s tender chunks of beef, sliced mushrooms and creamy sour cream sauce. So I had some fun and put these two favorite dishes together into one pot. 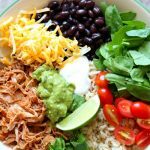 The results were simply amazing and my kids and husband and I all inhaled this meal. Everyone requested that I make it again really soon and believe me I will. This to me is a perfect slow cooker meal. Why? 1. 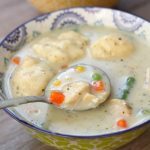 It only calls for 8 ingredients (but I’m only counting it as 5 since everyone has flour, sugar and water on hand) and takes only about 10 minutes to get into the slow cooker. 2. It takes all day to cook so it’s ideal for people who work and want to come home to a hot meal. 3. It’s full of flavor. 4. You can prep this meal ahead of time and put it in a freezer bag and use it as a freezer meal. The first thing that you’ll want to do is julienne some onions. I only used one medium onion because I was a little nervous that the onions would overpower the dish. BUT if I were to make this recipe again I would use at least 2 medium onions and maybe even 3. Because this recipe takes a long time to cook the onions actually caramelize in the slow cooker (YAY! no standing at the stove stirring for 40 minutes). 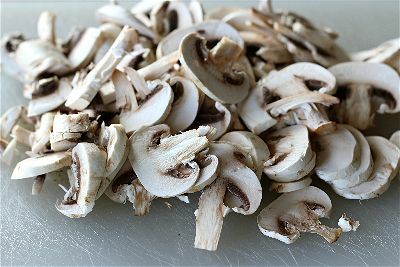 Next, you’ll slice up a pound of mushrooms. I just used plain old white mushrooms but you could use cremini instead. I love mushrooms! Don’t skimp on these. It will look like a lot but they shrink down a lot! We’re going to use beef stew meat for this recipe. I just bought the pre-cut stew meat at the grocery store for convenience. However, you could easily buy a chuck roast and cut it into one inch cubes. 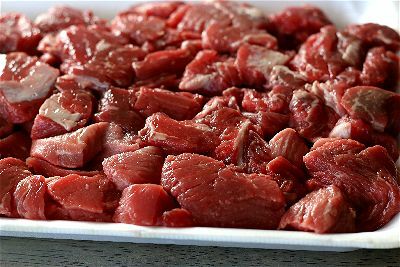 Most of the time it is actually a lot cheaper than buying the pre-cut stew meat. Don’t forget to add in the french onion soup base. It’s the flavor of the whole meal and is totally worth finding it in your grocery store or you can even buy it online. I told you it was easy to make! You’re going to let this cook all day long. I cooked mine on high for 5 hours but if you choose to cook it on low you could probably go for 8-10 hours. The onions need time to caramelize and the beef chunks need that slow and low cooking to get tender. You’ll add sour cream at the end of the cooking time (it would totally curdle if you added it in at the beginning). 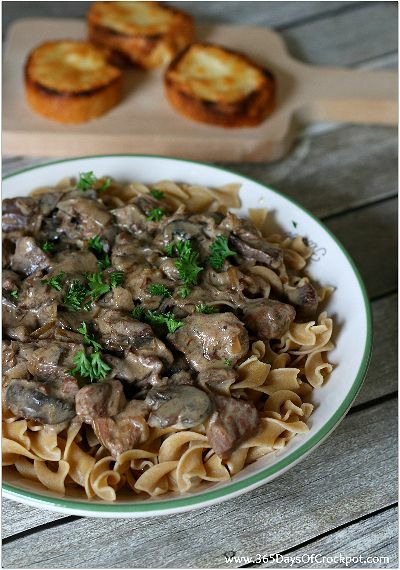 The sauce is dreamy…we served our beef, mushrooms and onions over egg noodles but you could serve over any type of pasta or even over rice (which is what my husband prefers). Place the thinly sliced onions in the bottom of the slow cooker. Sprinkle with the teaspoon of sugar and stir. Add the sliced mushrooms and the beef stew meat into the slow cooker. In a small bowl, whisk the soup base and the water together until smooth. Pour into the slow cooker. Stir a bit. Cover and cook on LOW for about 8-10 hours or on HIGH for 4-5 hours. Onions should be caramelized and the beef chunks will be very tender. In a small bowl, stir the sour cream and the flour together. Stir the sour cream into the slow cooker. 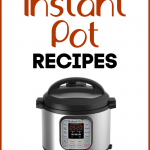 Turn the slow cooker to high and cook with the lid off for about 10 minutes. This will thicken the sauce up. Serve the beef and sauce over the top of egg noodles. I sliced up a baguette and melted some cheese over the top of it under the broiler. This really completed the French onion soup experience. Freezer meal instructions: Combine onions, sugar, mushrooms, beef and French onion base into a freezer zipper bag. Freeze. When ready to eat, pour contents of bag into slow cooker and add in one cup of water. Follow instructions 4-6 above. You will probably need to add a couple of hours to the cooking time if you put contents of bag into the slow cooker frozen solid, you you can always thaw the bag the night before in the refrigerator. 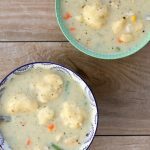 Thanks for the recipe – this was delicious! It tasted like I slaved away all day in the kitchen, but the prep was fast and easy. We followed the recipe as written, with the exception of an additional 4oz of mushrooms (we used Shiitake) and swapped 2% Greek yogurt for the sour cream. Perhaps it was because of the yogurt sub, it wasn’t quite as thick as we desired…but a little bit of cornstarch slurry did the trick. We all devoured it and are looking forward to leftovers tomorrow. I made this the other day and it was very good. I will be making it again, with a couple of small adjustments. I couldn't find the Orrington Farms soup base anywhere near me. Looked at Target, WalMart, Cub Foods, etc. Ended up using two packets of Lipton Beefy Onion Soup mix. Also used 3 baseball sized onions. I also am going to add a second tablespoon of flour to the sour cream at the end. Sauce was a little too thin for my liking. But the Mrs. loved it, so that's what matters! 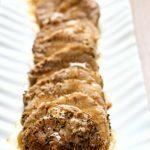 The recipe you posted looks delicious and I will be trying it soon. You can caramelize onions in a crockpot also. 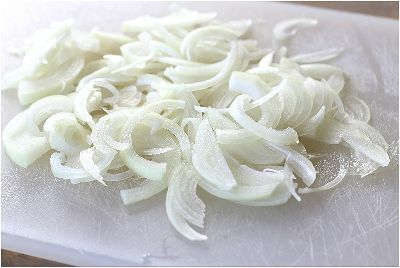 Cut up enough onions to fill your crockpot and add up to a stick of butter depending on how many onions you have. Turn the crockpot on and stir every couple of hours until the onions are browned and done to your liking. When done use them any way you want like as in French onion soup, on top of French dip sandwiches or on pizza. These onions also freeze well. I just freeze in one or two cup portions and use as needed. Oh my god, I am drooling looking at these pictures. 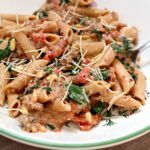 I think I may actually have all of the ingredients I need for this yummy dish, too! Score! Dinner is figured out for tonight! This sounds warm and comforting! Perfect for fall. Thanks! 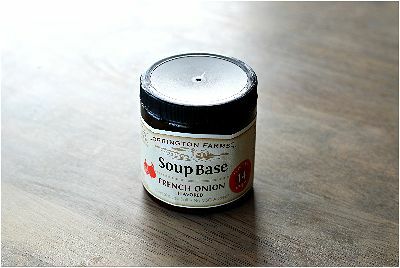 What could be used in place of the French onion soup base? Can't find it anywhere near me…. Darn! I'm thinking maybe a packet of onion soup mix?? This combination sounds so delicious, Karen. We are in our first real cold snap of the season in NH and this is the perfect meal for a chilly night. 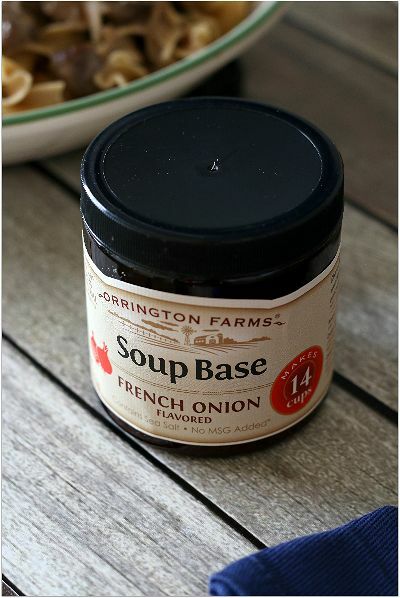 I've never tried Orrington Farms French Onion Soup Base, sounds wonderful in this recipe.